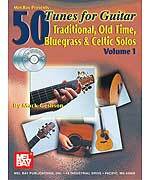 50 Tunes Volume 1 for Guitar is one book in a 5-book series. The 50 Tunes series is a collection of Bluegrass, Old Time and Celtic tunes for ensembles, families and individuals. This book contains the same 50 tunes as those found in the other 4 books of the series, but carefully designed for the guitar. The melodies in this book range from simple to advanced. Many tunes contain a harmony part to match the melody. 50 Tunes Volume 1 for Guitar is designed for "flatpicking" on the acoustic guitar. Flatpicking is a style of guitar playing, prevalent in Celtic and Bluegrass music which features fast soloing with a single, flat pick. Companion CDs included. Book written in tablature only.